Online Social Networks: Human Cognitive Constraints in Facebook and Twitter provides new insights into the structural properties of personal online social networks and the mechanisms underpinning human online social behavior. As the availability of digital communication data generated by social media is revolutionizing the field of social networks analysis, the text discusses the use of large- scale datasets to study the structural properties of online ego networks, to compare them with the properties of general human social networks, and to highlight additional properties. Users will find the data collected and conclusions drawn useful during design or research service initiatives that involve online and mobile social network environments. "In this new book about Online Social Networks, the authors discuss the way that the social brain places limits on how we express and use relationships on Twitter and Facebook. 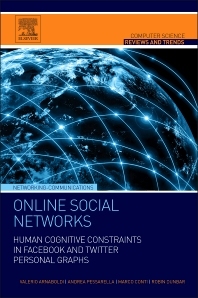 Through the analysis of the users' personal ego networks, the book shows how cognitive constraints are visible in the emergent properties of the graph of OSNs. As with the real world, so with cyberspace. We can only deal with just so-many "friends", and we can only follow just-so many threads. Of course, the narrow characterization of links as friends hides the actual strength of the graph-edge: it can be something that is oft-used, or a rarely trod track; a node at either end may be core to a cluster or peripheral; things change over time. 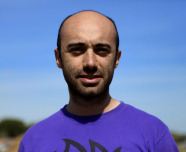 Dr. Valerio Arnaboldi Ph.D is currently a Researcher in the field of social networks analysis with the Ubiquitous Internet group of the Institute for Informatics and Telematics (IIT) of the National Research Council of Italy (CNR). Previously, he worked as a visiting Ph.D. student at the Social and Evolutionary Neuroscience Research Group at the University of Oxford (UK), under the supervision of Prof. Robin I.M. Dunbar. His research interests include social network analysis, social relationships modeling and context- and social-based services for networking solutions on mobile platforms. 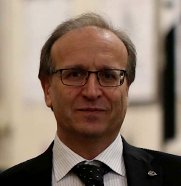 Dr. Andrea Passarella Ph.D is currently a Researcher at the Institute for Informatics and Telematics (IIT) of the National Research Council of Italy (CNR). He has published 100+ papers on Online and Mobile social networks, opportunistic, ad hoc and sensor networks, receiving the best paper award at IFIP Networking 2011 and IEEE WoWMoM 2013. He was Guest Co-Editor of several special sections in ACM and Elsevier Journals and of the book “Multi-hop Ad hoc Networks: From Theory to Reality” (2007). Dr. Marco Conti is a Research Director of the Italian National Research Council (CNR). He has published in journals and conference proceedings more than 300 research papers (related to design, modelling, and performance evaluation of computer network, pervasive systems and social networks. He is Editor-in-Chief of Elsevier Computer Communications journal and Associate Editor in-Chief of Elsevier Pervasive and Mobile Computing journal. He received the Best Paper Award at IFIP TC6 Networking 2011, IEEE ISCC 2012 and IEEE WoWMoM 2013 He co-authored the book “Metropolitan Area Networks (MANs) (Wiley 2004) and “Mobile Ad hoc networking: the cutting edge technologies”, (IEEE-Wiley 2013). Dr. Robin Dunbar is currently Professor of Evolutionary Psychology at the University of Oxford and a Fellow of Magdalen College. He is a Fellow of the British Academy. His principal research area focuses on the evolution of sociality. His current project funded by the ERC focus on the mechanisms of social cohesion. He has authored over 15 books including; The Trouble with Science (Harvard University Press) and Thinking Big: How the Evolution of Social Life Shaped the Human Mind (Thames) and over 300 research articles.